Today (April 5) is Qing Ming Jie, or Grave Sweeping Festival in China. The holiday is akin to Memorial Day in the states as a day to remember and honor your ancestors. But Qing Ming Jie is about so much more. Qing Ming Jie has religious overtones and turning honoring your ancestors into ancestor worship. In China many believe there ancestors' spirits enter a spirit world that still influences the living world. As a way to remain on the "good side" of these spirits, people burn items the spirits may need in the afterlife; the foremost item is money. Of course no one would burn real money, so vendors throughout town sell paper "hell money". The dead spirits may need other things as well including paper cars, houses, cell phones, bank books, or other paper items. 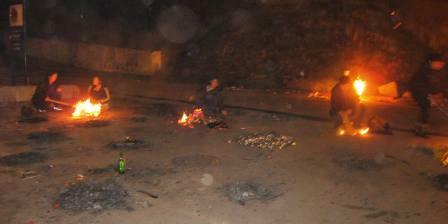 The items are burned at intersections so the dead spirit can travel from any direction and receive the burned offering. As we walked home observing all the fires burning to spirits my student explained what she thought about Qing Ming Jie. While she does not believe in the tradition, she said seeing all the fires made her afraid. She's afraid of ghosts and afraid a spirit might show up during the festival and scare her. I began to question if this fear actually meant that she did believe in the festival. If she really didn't believe, then she would have no reason to think a spirit might show up. So on one level, as with many Chinese, she does believe. Qing Ming Jie traditions prompt great conversations with Chinese. I can always find a way to bring up the festival anytime of the year because it's always on/near my birthday!